Really like the cubesat focus. Hmm......... no-one cares about launch success!? Of course it was a success, it's an Atlas V! Very good article again, William. Some photos, from Pat Corkery, ULA. Nice pics. The fog adds a cool effect. Could you see anything once it left the tower? Has the payload shown in the simulation any connection with reality? Certainly not. 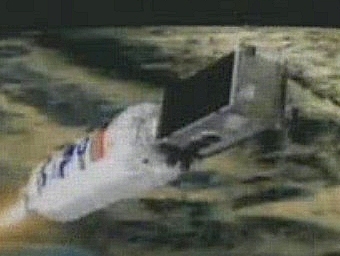 For illustrations of classified missions, they always use some kind of generic payload. Actually, it might be interesting to have a gallery of payload images from the Atlas, Delta-II and -IV simulations - They might be reusing graphics from an older non-classified mission! The Cubesats were deployed between 0044 and 0105 UTC on Sep 14. Is there another thread on the cubesats that I'm missing? The same post also has an image of USA 237, the/a NROL-15 payload. Even though they are dual satellites they only get one USA number then? I suppose that is done to cover the fact that it is a pair of satellites. @ ChileVerde thanks for that link, I have not come across that website before as well. An update on the main payload orbits and an interesting discussion by Ted Molczan about a unique gravitational effect in the orbit used by these satellites which leads to a significant reversal of initial eccentricity.